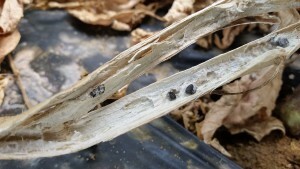 White mold, or timber rot, caused by the soil-borne fungal pathogen, Sclerotinia sclerotiorum, was found this past week in a high tunnel. 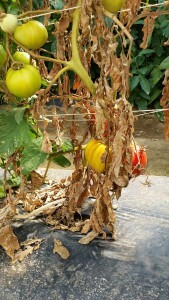 High tunnel tomato plant with main stem infected by white mold. 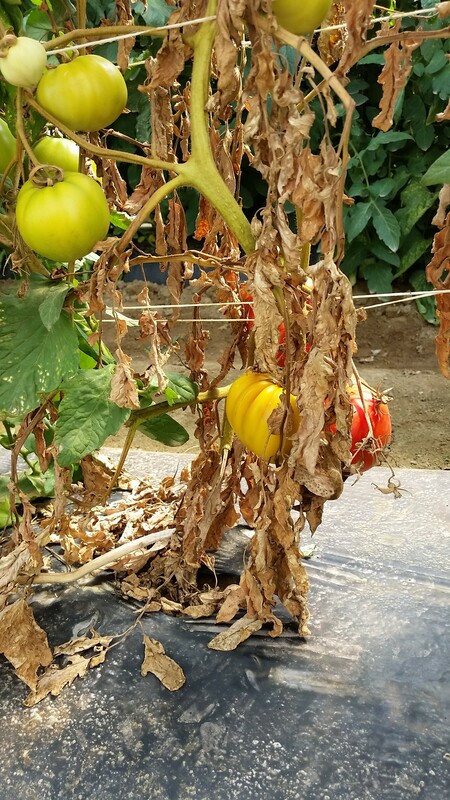 The photo on right shows a high tunnel tomato plant with main stem infected by white mold. Over time the entire plant will slowly collapse looking similar to a wilt or root rot pathogen as the water supply is cut off to the plant. White mold is common and once introduced into a field or high tunnel it can very difficult to control. The pathogen produces black sclerotia on the surface and inside infected stems. Sclerotia, if they make their way back into the soil, can survive for years causing significant problems. Infected stems will turn a light brown color and dry up becoming brittle. If the main stem is infected the entire plant will collapse looking like a wilt or root rot issue. 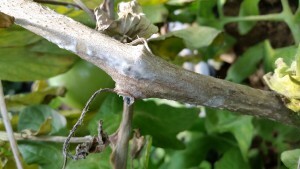 Under hot, humid conditions white fungal growth will develop on the surface of the stems and in some cases sclerotia will develop on the outside of the stem. Breaking open the stem will reveal numerous black sclerotia. All infected plants and or plant material need to be removed from the greenhouse or high tunnel immediately and disposed of properly. Preventative protectant fungicide programs beginning at flowering will help control white mold. Cool, wet weather and poor air circulation favors disease development. Tomato stem infected by white hold. Note the fungal growth on the surface of the stem. White mold of tomato. Note the black sclerotia developing inside the brittle stems.